Many of the information displays in the various screens of GTX have coloured backgrounds and/or text which can help to ensure easy and rapid recognition of important features without the need to read the text. 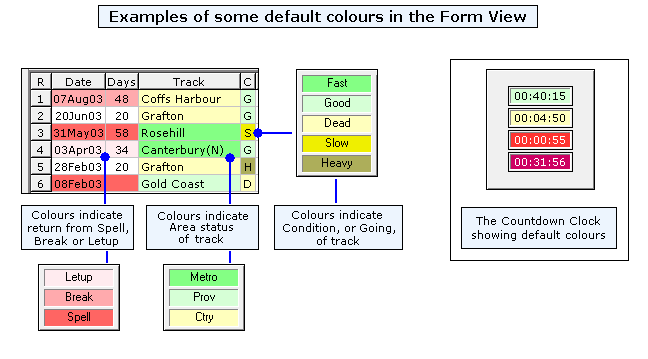 In some instances the colours provide auxiliary information relative to the field that they are applied to, such as the track names in the Form View, which are coloured according to their area status - Metropolitan, Provincial or Country. You will also notice that the background colour of the Countdown Clock is time-sensitive and will change colour at various intervals before race starts. Colours can be changed to suit your own personal tastes, and it's a simple matter to do so. On the Menu Bar, click on 'Setup', then 'Colours'. 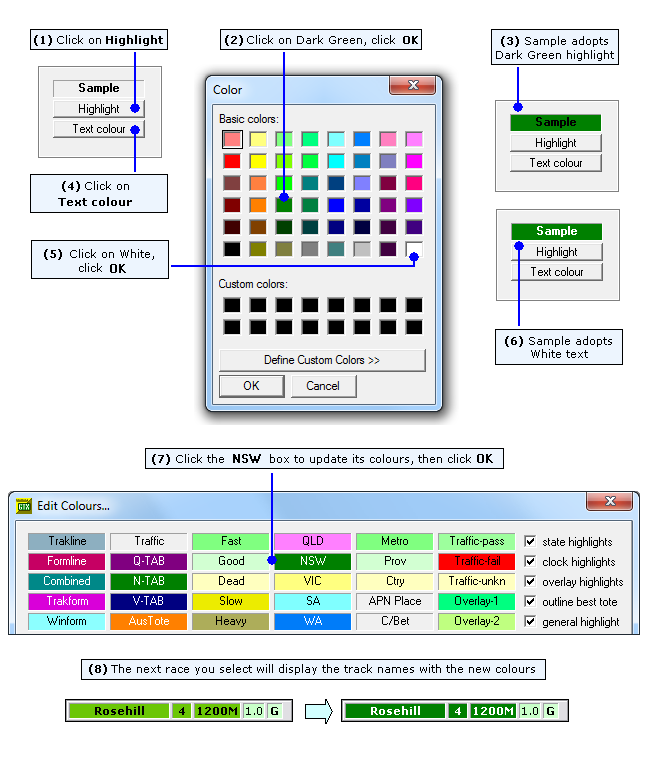 The 'Edit Colours..' box, shown below, will open, displaying all the currently selected text colours and background highlights for the various parameters. For the purposes of demonstration, let's say you want to change the colour highlighting of the 'NSW' state colour from the default green, to a darker green. 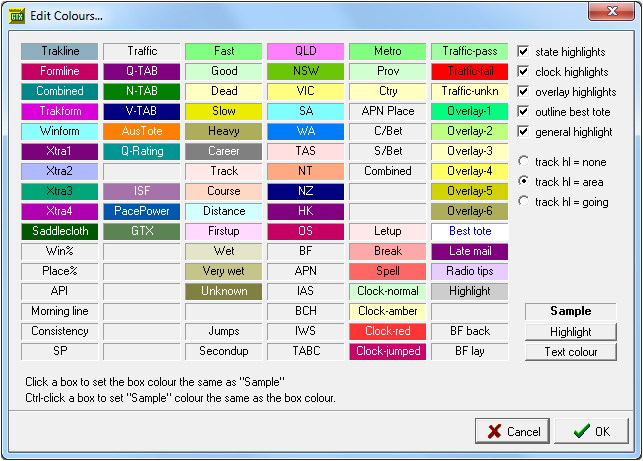 The background colours highlight the track names in the Field View, and are coloured according to the state of Australia each track is in. Please note that because of the darkness of the newly selected colour, the existing black text will also need to be changed to something lighter. This example will therefore be a two step process, and it is a lot easier to do than to explain how to do. Basically it involves changing the sample box to the desired colours using the Highlight and Text colour buttons, then clicking in the text box of the parameter you want to change - in this case NSW. The following image gives the step-by-step process. Another, simpler way to change highlighting and text colours can be to adopt the colours of another parameter already existing in the 'Edit Colours...' box. Say for example, you want to change the colour highlighting of the 'NSW' state colour from its default green, to the colour of the N-TAB parameter. First, Ctrl+click the N-TAB parameter (hold down the Ctrl key on your keyboard and click the N-TAB parameter). This 'sends' the colour information to the 'Sample' box. Then click the NSW parameter, and its colours will change to match those of the N-TAB parameter. In the top right corner of the 'Edit Colours..' box, there are several checkboxes that, if unchecked, turn off the colour highlighting in the related parameters, which are the state, clock,TAB overlay highlights and the best tote outline. 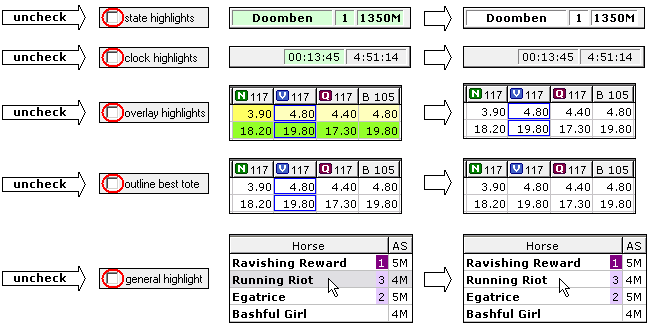 Immediately below the checkboxes are three more options which control the colour highlighting of the track names relating to the horse’s past runs in the Form View. You are able to choose no highlighting, or highlighting signifying the Area status of the track (ie Metro, Provincial or Country), or highlighting which indicates the track Condition, or Going. The default setting highlights the past run tracks according to their Area status. If you have changed colours and/or other colour options and are happy with that setup, you are able to save it as your own default colour set. 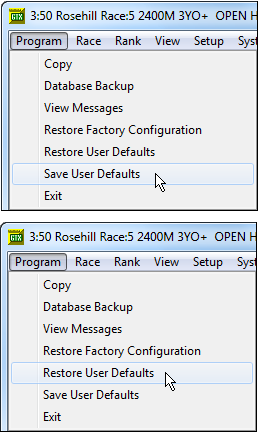 On the menu bar, select Program, then Save User Defaults. This will allow you, at some later stage – perhaps after trying a new setup or after temporarily using a different display for a particular purpose – to recall your saved User Defaults, by selecting Program again, then Restore User Defaults. Bear in mind that this action will also save/restore other defaults you have changed, not just colours.